You guys make the best subs around…thank you. – Susan W.
Great BIG wonderful Subs is all I can say. And their breakfast quick-orders set the standard. I’m pretty new to the Freehold area, and love the fact that they’re right around the corner. Friendly staff that know their client’s needs……. Subs ! – Mike T.
This place has been here as long as I’ve lived in Freehold (~14 years). I remember going here for subs before going to the beach back when I was in high school. Their subs are well known. All the ingredients are fresh, subs are cheap considering how much they give you! 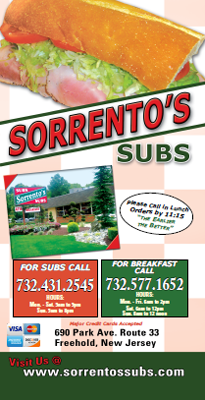 – Holly C.
This spot has the best subs ever. Once my boyfriend introduced me to Sorrento’s, I was absolutely hooked. I don’t eat meat but everything is so fresh that it never seems like anything is missing. – Kelly B. "You guys make the best subs around…thank you."